The basic call to discipleship is addressed to all Christians, in whatever way of life God has destined for each of them. But the Lord calls some to a particular way of life, a life of total commitment to serving the Church as a priest, deacon or religious. The mission of the Cathedral Vocations Committee is to encourage, foster, and pray for religious vocations. We strive to raise awareness of the important and distinct role of priests, deacons, and religious brothers and sisters in the Church. We ask the Lord of the harvest to send laborers into the vineyard so we will enjoy a flourishing of religious vocations in our own parish and in our own time, as well as in our diocese and in the whole world. We believe that God always provides an abundance of vocations, but sometimes His call cannot be heard above the din and confusion of the world. 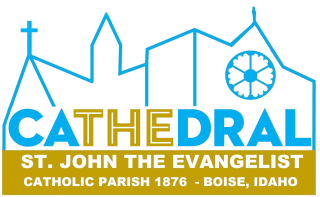 Bishop Michael Driscoll has called all people of the Diocese of Boise to offer special prayers for increased vocations, asking that they spend time before the Blessed Sacrament for this intention. In accord with this request, we encourage parishioners to spend some time each week praying for vocations during Eucharistic Exposition, which follows each weekday Mass in the Cathedral Chapel. Day of Prayer for Priests. Prayer cards available after 8:30 am Mass. Parish religious sister birthday observance. Feast of St. Lawrence, deacon and martyr, in honor of permanent deacons. Prayer cards available after 8:30 am Mass. Clergy Appreciation Potluck - Parish potluck sponsored by Vocations Committee and Knights of Columbus. We honor priests and seminarians by remembering them with birthday cards and special celebrations. We also present small gifts and/or spiritual bouquets to each newly-ordained deacon and priest. *We have a Vocations presence at as many parish events as possible. Meetings are bi-monthly in September, November, January, March, May, and July on the fourth Tuesday of the month at 11 am in the JP II Room. With complete confidence in God’s bountiful love for His people, we entrust our work and its success to the Lord of the harvest, from Whom all vocations come and in Whom all vocations flourish. The family plays an irreplaceable role in fostering religious vocations. Children first learn generosity and self-sacrifice at home, through the example, in word and deed, of their parents. Because religious vocations are born in the family--which is the Domestic Church--our hope is that all parents will encourage their children to seriously consider whether God is inviting them to become a priest or religious. A religious vocation is always a personal invitation from the Lord, but often that invitation is heard in the voice of others. Many priests and religious will say that the first stirrings of their vocations welled up as a result of a conversation or comment from a pastor, a teacher, or a member of their parish. We hope that more people will have the courage to invite a young man or young woman to consider a life of total commitment and service, in the form of a religious vocation. We hope that you will pray fervently for abundant vocations to spring forth in the Cathedral parish. And we hope, finally, that you will consider joining us in this rewarding and vital work for the life of the Church! The Vocation Seekers Committee has created the Invisible Cathedral as a way to show prayer support for victims of abuse and also for our our priests of the Diocese of Boise. Invisible Cathedral is a community of people committed to praying for vocations. Our goal is to attract enough members to pray for vocations 24 hours a day in every diocese. Mailing Addresses for Current Seminarians and Religious Vocations Those in formation love to receive cards, letters and words of support. Explore a vocation to priesthood, permanent diaconate and religious life!